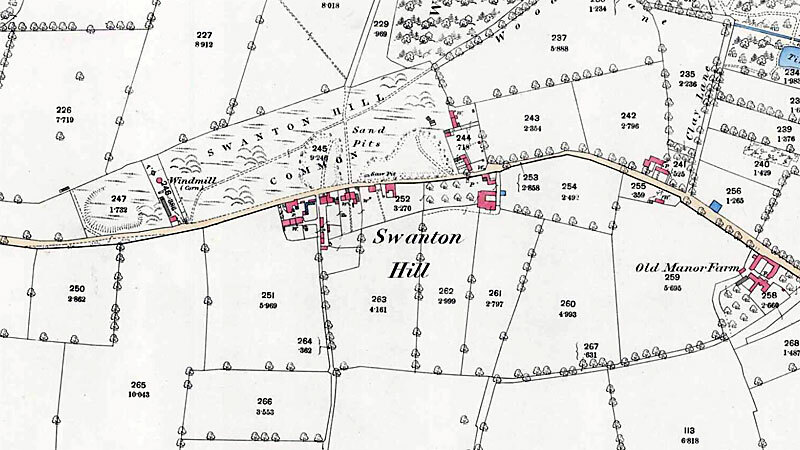 Swanton Abbott towermill stood on Hill Common. The tower was 4 storeys high and built of brick c.1845. It had 4 double shuttered sails, each with 9 bays of shutters struck via a rack and pinion. The dome shaped cap was topped with a ball shaped finial and also held an 8 bladed fan. The sails powered 2 pairs of stones and a flour mill. A portable steam engine in a shed that stood alongside provided addition power in times of low wind. 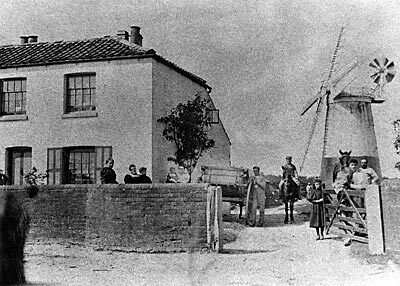 Robert Page, son of local farmer John Page (b.1796) married Charlotte, daughter of Benjamin Postle Woollsey of Swafield_watermill and he later left Swanton Abbott to take took over Swafield_mill on the death of Benjamin Woollsey c.1860. Messrs. IRELAND have received instructions to Sell by Auction in two lots at the King's Arms Inn, North Walsham on Thursday September 29, 1870 at 5 for 6 o'clock for the following desirable Property. Lot 2. 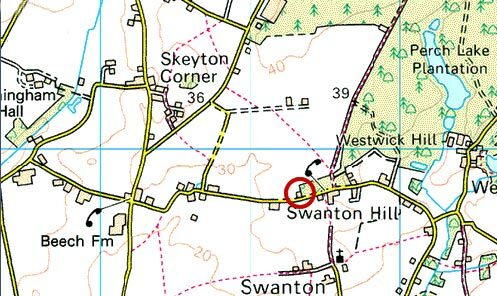 A well situate Brick TOWER WINDMILL driving two pairs of Stones and a Flour Mill, with capital Dwelling House, Stables and Outbuildings, situate at Swanton Abbott and in the occupation of Mr. Robert page. Possession can be had at Michaelmas next. Particulars of W. Forster Esq., Solicitor, Aylsham and of the Auctioneers, Guestwick, Thetford. 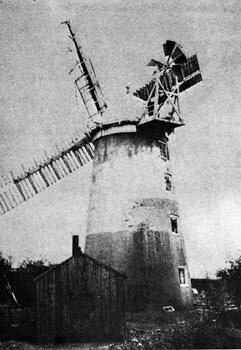 Two Photographs ... tower mill at Swanton Abbott in Norfolk was struck by lightning in May 1901. One of the miller's children can be seen at the base of the mill among the shattered timbers which have fallen from the broken sails. The photos also showed a shed alongside the mill containing a portable steam engine used for auxiliary power. The (above) picture is of my family members. According to a cousin, Elizabeth Ann Hunt, it was taken about 1906. Those in the picture are (left to right): Mary Elizabeth Goose Hunt, Edith Rachel Hunt, Ruth Elizabeth Hunt, Amelia Mary Hunt Gray holding Ethel (born May 13, 1905), George Herbert Hunt, Benjamin John Hunt (age 11) on horse, John Benjamin Hunt, Sr. (small figure in background), Flora Rebecca Hunt (age 13, holding gate), Kate Sophia Hunt Daniels, Earl Flaxman Daniels.